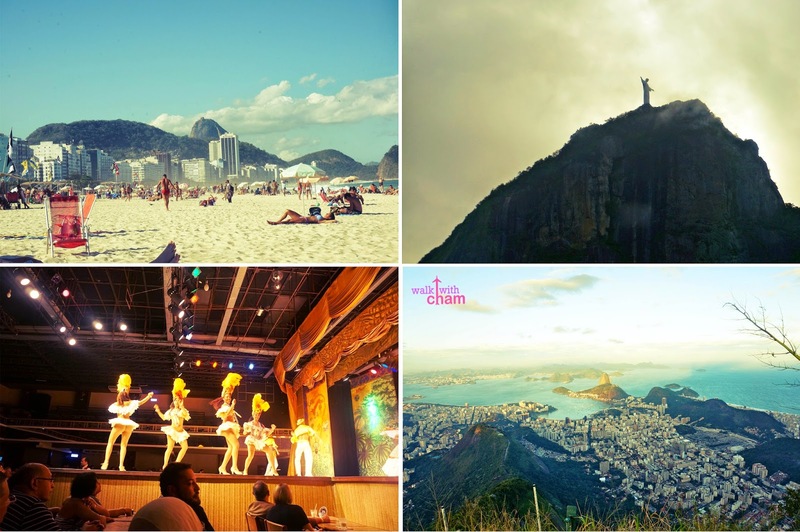 If you are from the Philippines and you want to go to Rio de Janeiro, Brazil for several reasons like witness the 2014 FIFA World Cup, watch the Rio 2016 Olympics, party during Mardi Gras Carnaval or just want to visit Christ the Redeemer and swim in Copacabana & Ipanema Beach here is a brief guide of some of the things I did and wish I did that might help you with your Brazilian Trip. Because Brazil is located in South America which is on the very opposite side of our country it takes 23 hours to travel without the layover waiting time. This is one of the things that I love about Brazil, they don't require Brazil Visa for Filipinos yet American Citizens are required to have them- pretty neat huh? Take note that the flight going to Brazil is NOT CHEAP. Mine costs at about P143,125.00 round trip via Emirates- Thank God for Tresemme!!! There are several options for a stop over when going to Brazil, in my case the connecting flight is in Dubai. So expect to have a 'jet lag' once you arrive in Brazil. My Mama had a very difficult time dealing with it so I suggest to sleep the entire day once you arrive in Brazil in that way you will revive your strength the very next day. As of this writing the equivalent of R$1 (Brazilian Real) is P18 (Philippine Peso) and $1 (US Dollar) is R$ 2.4 (Brazilian Real). We have our dollar changed at the hotel but it's cheaper (daw) to have your dollars change at Rio de Janeiro Airport. From the very start of my Brazil preparations I heard & read a lot of mugger stories from family, friends and the internet that kept me very paranoid from day 1 till our last day (watching City of God years before didn't help either!) That was why I was veeery careful with our belongings. Because we were both ladies we opted to arrange tours when we want to see famous sites. Important tip that I learned: do not bring all your money with you when you go out, put it in the hotel safe. Also do not bring your passport with you, just bring a photocopy/scanned passport when going out. top: Local lady who offered to translate what we want to say at a coffee shop. The best way to go to Brazil is to ask a travel agency to arrange the flight for you, in this way they will know what's the best connecting flight to take plus they will also help arrange your accommodations, transfers and tours. hi cham! i would like to ask if you have any idea about any travel agency here in the philippines who has ALL IN PACKAGES to brazil? please do message me at my facebook account for your response on my query. Gusto ko pumunta ng brazil then mag apply ng work dun...is that possible?...ok lng kaya un? I really enjoyed this blog and gave me an idea of how to plan our trip. My partner and I are currently planning to get married there around february. But knowing that it'll be "hot" summer, I think we can rearrange. I'm coming from US and my partner in philippines. A very expensive trip indeed. Where airport did you arrive in Brazil? Hi cham! !,i am planning to go to brazil also cause my bf is there.he is a brazilian.and maybe i will stay in his house during my tour.do i still have to book for a hotel?do i need a return ticket before going there?,or may i buy a return ticket in brazil?is it only dubai airport that you pass through? Hi Allen Joy, if you are staying in his house I guess that would be more practical as you can save money and allot it somewhere else. The ticket going back is up to you. But I highly suggest you book your ticket prior to flying as the immigration might ask for it when you arrive in Rio. Thank you for answering my question..it is highly appreciated. But i have a last question,.do i have to show money if i will go there?or will they check my bank account?if yes,how much money will i have to show if i will stay in 2weeks in brazil? Hi!! Just wanted to ask if a transit visa is needed for your connecting flight in DXB. Thanks! Hi cham! nice blog here... very informative. I am planning to visit brazil for the 2016 Summer Olympics on Aug 5-21. Tanong ko lang kung may kakilala kang group (or individual) with same plan? or baka may alam kang nag oorganize ng group tour to brazil Olympics? btw, I am going there solo, that is why I am searching for possible network planning to go there to save cost on accommodation (at least). Thanks! hearya soon! Gusto ko po sanang manghingi ng advice sa inyo kung okay lang po. I have a brazilian bf po more than 2 years na po kami and 4 times na po syang pabalik balik dito sa Pilipinas. And he really wanted me to visit his place too which is in brazil kaso lang po 2 times na po akong na offload,noong una, i only brought with me a passport,roundtrip ticket and small amount of money kasi sagot nya lahat like house,foods etc.kaso po ang immigration officer ay humingi sa akin ng mga dokumento na nagpapatunay na kami ay may relasyon like pictures namin,at supporting document from him at wala po akong naipasa noong una,at sa pangalawang beses po ay na offload na naman ako,dahil kulang ng supporting document ang kinuha lang kasi namin ay authorization letter from embassy here manila ngunit hindi nila yon tinanggap kaya offloaded na naman ako.....At next year gusto na naman nyang subukan,na magkasama kaming dalawa sabi nya dalhin na daw nya bank account nya pati lahat ng credit cards para ipakita sa immigration na kaya nya akong suportahan dun...sa palagay nyo po okay na ba yun? e allow na po ba nila akong makatravel? or ano po bang dapat naming gawin?...please,i badly need your advice po..thank you ! Thank you for taking the time to read my Brazilian posts. I'd love to help anyone who needs my advice about travels however I'm afraid I think I'm not in the right position to answer your question. When we went to Rio de Janeiro we were never questioned about anything kasi. We never presented documents or airfare tickets. I have a question though sinong immigration officer ang nag off load sayo? here in the Philippines or in Rio? Maybe you should be ready and purchase a round trip ticket manila-rio-manila in that case alam nila na babalik ka sa Pilipinas. Maraming salamat po sa pagsagot sa aking mensahe. Ms. Cham, ang immigration officer po dito sa Pilipinas ang nag offload sa akin ng pangalawang beses. Meron nman po akong roundtrip ticket po at saka valid passport at may kaunting pera kasi ang bf o fiancee ko po ang sasagot sa lahat na gastusin sa pag stay ko doon sa brazil. At next year po plano nya akong dalhin sa brazil pero this time po magkasama kaming ba byahe,at sabi nya dalhin na nya lahat ng bank accounts nya at credit cards para ipakita sa immigration na kaya nya akong tustusan doon(kasi thats one of the requirement which the immigration officer was asking for me aside from the pictures namin,recebo ng pinapadala nyang pera at authenticated supporting document from the philippine embassy in brazil). Sa palagay nyo po ba Ms. Cham hindi na ako ma o offload this time na kasama ko na sya? What do you mean 140k? For the entire trip? I'm not sure on the airfare. More information about Rio Di Janerio and this time all these resources are far valuable as Olympics 2016 is going to be held at the same place. People from different corner of the world will be there to enjoy both the giant gaming competition and natural beauty of Brazil. So, for the outsiders, a proper guide is very much important to explore the distant places. Your blog will be truly helpful for such visitors. I may suggest the name of Rio Vip Pass as they have already gathered some better reputation and positive responses including me. Just contact with the professionals and start planning for a new Disney land. Thanks for the conversation. Good evening Cham, I was womdering if you can help me out. My boss is also planning to buy me tickets to go with them to Brazil. They will be flying out from the U.S. and me from the Philippines. I'm having second thoughts on going since I'm not sure what are the requirements needed or documents that I need to present. I hope you get to read this. Thank you! Sorry Cham, I forgot to put in my name. Anyway, I'm leaving this January 4th 2015, if everything pushes through. My boss told me that airfare is no problem. I just need to know what documents are needed on my end. Do I still need to present a letter that they will be sponsoring me for this trip? Any advise you can give is a big help. Thanks again! Obrigada which means thanks. The most useful Portuguese word during my travel in Sao Paulo and Rio. Ask ko lng po meron bang direct flight from hongkong to Brazil? Hi there! I am planning to go to Rio for 2018 Carnival parade. Most likely by myself, but would like to have others join me as well! I found some tickets within my budget via Turkish airlines or ethiopian airlines. I am planning to stay at some hostels around the area. Did you go to sao paulo also and other countries in south america? And also, how do you think i should go for public transportation there? I heard it's traffic, and I am aware that i have to not have things like watches out or anything that makes me look like i'm a tourist! I am planning also to travel to Peru! Hope you can reply because you make going to Brazil less intimidating. Thank you! Thanks Cham this blog is very helpful. please do a lot of blog soon! It's a shame that there are only a few detailed blogs/articles about Filipinos traveling to Brazil. Your post is really helpful. I am also planning my trip to Brazil by the end of the year / Q1 of 2019. I am just figuring out the best way to get the cheapest connecting flight - preferably sa Dubai nga. You mentioned that they never asked you and your mom transit visas in Dubai - did you ask before your flight if you need one or not? Medyo paranoid kasi ako na baka by the time of my flight, they'll ask for it. Your answer will be greatly appreciated. Hi Arch! thank you for the kind words.